How do voters want to fund healthcare? On Jan. 23, Oregon voters will decide whether or not to keep some major sections of a bill designed to help pay for healthcare for the state’s low-income individuals and families. Ballots should be arriving soon asking voters whether they approve of the House Bill 2391’s methods for paying these costs or reject certain financial aspects of the bill. As written, HB 2391 imposes, among other things: temporary assessments of 1.5 percent on premiums charged by health insurance companies for a time period of two years; and an additional .7 percent assessment on large hospitals. Those assessments drew the ire of Rep. Julie Parrish (R-37 Tualatin/West Linn) and Rep. Cedric Hayden (R-7 Roseburg) the chief petitioners behind Measure 101 that voters will be asked to decide on. “We have surgically extracted five pieces. If we wanted to blow up Medicaid, we have the ability to refer the entire package to the ballot,” Parrish said. Parrish and Hayden took it upon themselves in recent weeks to visit newspapers throughout the state to drum up opposition to the funding mechanisms included in the bill, but neither claimed opposition to the social safety net created by programs like Medicaid and Medicare. The main points of their argument hinge on the way money will change hands and what will happen after it ends up in government accounts. At issue are sections of the bill that: impose an assessment on the gross premium amounts collected by the Public Employees’ Benefits Board; impose a 1.5 percent assessment on the insurance and managed care organization premiums; allows insurance companies to pass along the 1.5 percent increase to policy holders; and establishes a new .7 percent assessment on large hospitals. The new assessments are expected to generate an additional $210 to $320 million, but those figures are only part of the equation. The money collected is matched through federal programs on a $3-to-$1 basis, which means loss of the “seed” money could result in more than a billion fewer federal dollars coming into Oregon to cover Medicaid recipients. The initial assessment is given back to insurance companies with a 3 percent interest and the state uses the remainder to cover the state’s Medicare expenses. Parrish isn’t thrilled with that arrangement, but said that the Coordinated Care Organizations subjected to the new assessment wouldn’t receive the initial investment back. Moreover, she is concerned about the groups left out of the new assessment, including large companies. She calls it a tax without a three-fifths vote of the legislature. 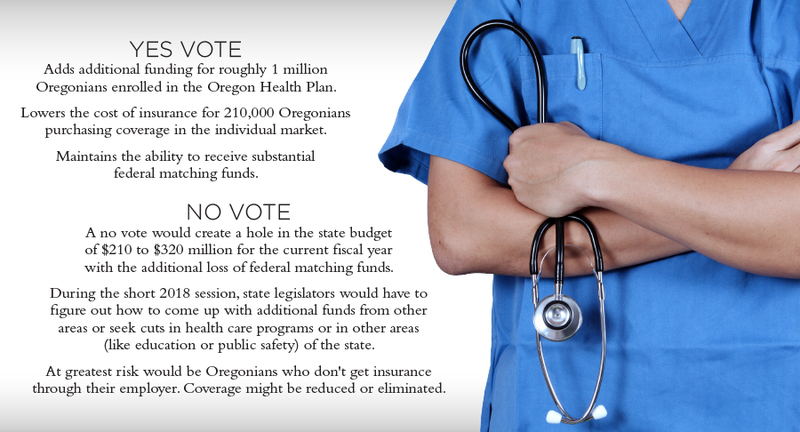 “The 1.5 percent insurance tax affects 217,000 Oregonians who buy their care inside or outside of the exchange. Of that number, only 41 percent qualify for a tax credit, the rest pay full freight,” she said. Entities like school districts and other large public service organizations, she said, will bear the brunt of the new assessment. “If we don’t solve this and the ACA (Affordable Care Act) doesn’t change we are looking at a tax on public employees that is going to eat up budgets,” Parrish said. Adding a new .7 percent assessment to large hospitals is the major sticking point for Hayden. Under the ACA, states are allowed to charge large hospitals up to 6 percent on net revenue to cover the costs associated with the program. However, the exact percentage must be tied to the number of patients, known as “lives,” enrolled in the ACA in the state. Currently, the state is charging the hospitals 5.3 percent to cover a projected 1.5 million lives enrolled in the ACA throughout the state. Parrish and Hayden have been keeping watch over the enrolled numbers and it shows them well below the projections, and dropping. In July 2016, the number of eligible residents was 1.06 million. A year later, eligibility had dropped to 995,000. As of November 2017, eligibility had dropped again to 962,000. A rebounding economy and higher minimum wages are likely playing a part in the declining eligibility. Establishing a new .7 percent assessment (the difference between 5.3 and 6) is, in effect, “hard tax,” Hayden said. “It draws down all the head room that the program is supposed to have to cover expanded services. The money collected will be stacked on top of the Medicaid funding, but it can be swept for other purposes,” Hayden said. Between the insurance premium assessments, the new hard assessment and the shrinking eligibility numbers, Parrish is concerned that the Legislature is trying to create a surplus within the state’s Medicaid budget that could then be redirected for other purposes. Parrish and Hayden reiterated that they were not opposed to paying for health care, but that the funding mechanisms in the current bill did not consider alternatives, like directing healthcare rebates to go back to the state rather than the insurance companies when public money was used to cover the initial outlay or moving public employees to the health care exchange. “We’re not without solutions, and we believe we need healthcare,” Parrish said.